John Wick 3 is currently filming and the production took a quick second to send out a save the date for fans, letting them know that the movie comes out exactly one year from today, May 17th, 2019. Keanu Reeves has been spotted on the set and he can be seen in the new social media post announcing that the highly anticipated third chapter in the John Wick series is on the way. Though the new look of Reeves as the titular character doesn't look very new, it's still pretty exciting. Plus, the fake rain makes it look pretty cool. 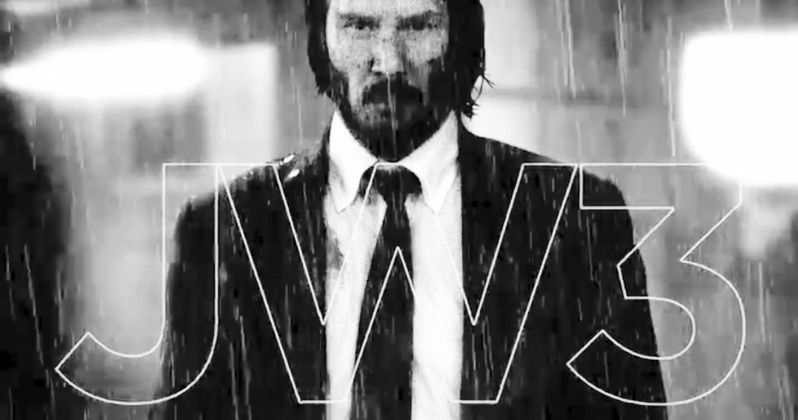 The official Twitter account for John Wick 3 sent out the aforementioned newish look at Keanu Reeves with a short caption that reads: "Be seeing you... 5.17.19." There's not much else other than that, but it's enough to start to raise hype for the movie. Chad Stahelski returns to direct the third and final installment in the John Wick trilogy, and he's been talking about the project since the last movie wrapped. John Wick 3 was green lit right after the second movie hit theaters and Stahelski has been very excited about being able to direct the third film. As for the plot of John Wick 3, like Chad Stahelski has said in the past, the stakes are much higher this time around. Keanu Reeves' Wick is on the run and he needs to blast his way out of New York City. There's a huge open contract on Wick's life, which makes matters a little more difficult. The official synopsis for John Wick 3 reads. "John Wick (Keanu Reeves) is on the run for two reasons... he's being hunted for a global $14 million dollar open contract on his life, and for breaking a central rule: taking a life on Continental Hotel grounds. The victim was a member of the High Table who ordered the open contract. John should have already been executed, except the Continental's manager, Winston, has given him a one-hour grace period before he's Excommunicado - membership revoked, banned from all services and cut off from other members. John uses the service industry to stay alive as he fights and kills his way out of New York City." John Wick 3 director Chad Stahelski recently talked about what he wanted to accomplish in the final chapter of the franchise. Stahelski noted that he wanted to fix some of the aspects that they weren't able to cover in Chapter 2. Fans will be treated to a more of an inside look at how the underground works in New York as well as the global scale. He had this to say. "We want, not so much to go bigger on the third one, but to show you more of the intricacies of the world... I feel like there are all these different subtleties that I skipped over in Number Two, that I'd like to go back to on (chapter three) and show you the inner workings of different parts of New York." John Wick 3 is going be all out war, as Keanu Reeves' Wick tries to get out of New York City alive. It's going to be a huge hurdle to overcome now that the master assassin doesn't have any of the Continental resources at his disposal. While we wait for some official footage of John Wick 3 to drop, you can check out the new save the date below. The reminder of the May 17th, 2019 release date comes to us courtesy of the official John Wick 3 Twitter account.